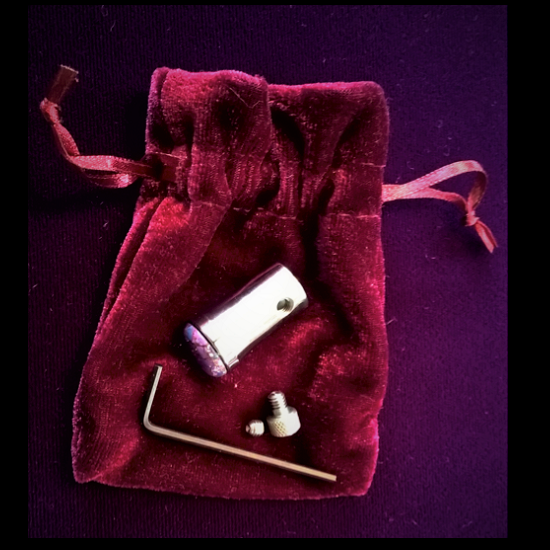 Sunreed’s Crystal Attenuators are designed to enhance wellness practices utilizing tuning forks. The Attenuators are designed to fit over the ‘foot’ of most tuning forks. It has two locking mechanisms which accompany it. One is a knob screw which can easily be inserted and tightened by hand. The other is an allen screw. The allen screw comes with an allen wrench that allows one to insert the screw and tighten it onto the tuning fork foot, below the surface of the Attenuator. Simply choose the one which you most enjoy. The Attenuator has the flower of life lasered into its flat surface. And, upon that, a gemstone of your choosing is set. 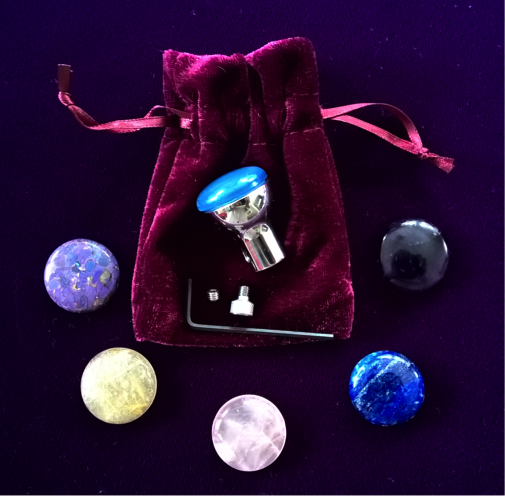 Each gemstone is permanently affixed, so each Attenuator comes with only one stone, though there are many choices, and two sizes to choose from. The gemstone crystal brings the quality of light and energy it carries (see chart at right for common gemstone features,) along with the practitioner’s intentions, to merge with the sound vibration of the tuning fork. The crystal, also, enhances the scope of the tuning fork’s vibration due to its larger surface area. Thus, we have the merging of light, sound, and energy, which leads to a greater healing potential from both the tuning fork and the crystal itself. We hope you enjoy your tuning fork Crystal Attenuator experience. We are available to consult with you on the use of this and many tools of sound and shamanic healing as available on our web site. We are specialists in the field, and conduct trainings internationally, as well as private skill development programs which can be conducted in person, by phone or skype, to assist in your endeavors of personal and professional therapeutic healing practice. This style of Attenuator is designed by Dorothy Stone on our Sunreed team. They are hand made by a master machine craftsman in the USA, who is part of the human consciousness movement, versus being mass machine produced.